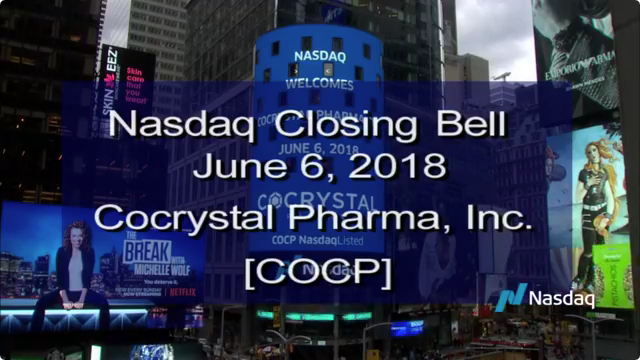 Cocrystal Pharma, Inc. is a clinical stage biotechnology company discovering and developing novel antiviral therapeutics that target the replication machinery of hepatitis viruses, influenza viruses, and noroviruses. Cocrystal employs unique structure-based technologies and Nobel Prize winning expertise to create first- and best-in-class antiviral drugs. CC-31244 is in a Phase 2a trial. It is a broad-spectrum novel non-nucleoside replication inhibitor of the hepatitis C virus. Phase 1b studies in HCV-infected patients showed the largest reduction in viral load of any non-nucleoside inhibitor tested to date. CC-31244 is now in clinical trials as part of a cocktail for ultra-short therapy of 6 weeks. The Company's lead candidate for influenza is effective in animal models against both the pandemic and seasonal strains of influenza. In addition, the Company has a pipeline of promising early preclinical programs.